Team photo from the "Czech Republic English Camp 2014" Facebook page, with Kristina holding the American flag sweater! 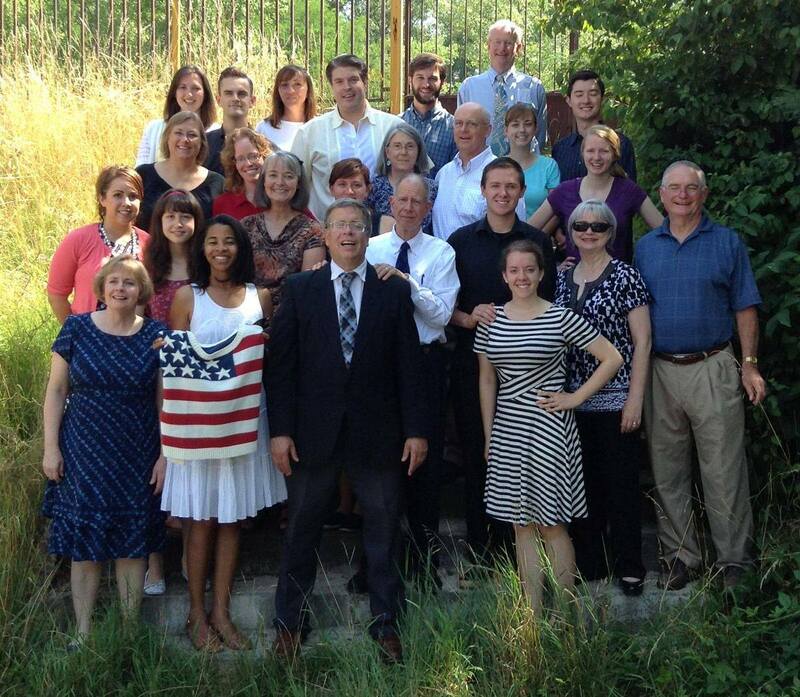 NOTE: In July 2014, Kristina Mellon joined the team that was organized by Bayview OPC (Chula Vista, CA) and traveled to the Czech Republic to present the gospel in the form of an English Family Camp. Kristina shared with us the following letter, which she sent to friends and family upon her return from the short-term mission trip. Thank you for your prayers and various means of support for me to go on this mission to the Czech Republic. I have been back in the U.S. one week and I have spent part of that time thinking about what to say and how to sum up the mission trip to spread the good news of Jesus Christ. Since January or February of 2013, I have been praying the Lord would allow me to go on a short-term mission this year. Since those 10 months of prayer, subsequent seven months of preparation and more prayer, the Lord allowed me to serve on this year’s team for two weeks in the Czech Republic at English Camp. Being on this mission superseded all my previous experiences in traveling. When answering official questions for the hotel or customs about the purpose of my visit, the choices were either “business” or “tourist.” My “mission” answer did not belong in either category. Every day leading up to and during the camp, my mind and heart were consumed with how to serve the Lord or I was reminded that I was there to serve Him. Instead of thinking about where I would eat and what sights I would see, I was thankful for health and God’s provision as fuel to serve Him everyday. My concerns were: trying to be of one mind with my team, live each day as prayerfully as possible, to follow the Farniks and our team leadership, to minister to and seek to understand the Czech people. Allow me to share this example: upon arriving in Prague, Pastor Farnik picked us all up at various times from the airport. Later, the Farniks’ welcomed us to dinner and then, a team meeting at their home. As soon as we all gathered in their sitting area, the very first thing we did as a team was sing the Doxology. At once, my heart was filled with peace, humility and gratitude to God: for a safe trip, arrival at the desired destination on the right day, for being with the team, for the blessing of the Farniks’ witness and for being able to take part in the mission. My heart was also filled with the seriousness of the work we were about to do. Every morning during camp, our team met for devotions to prepare us to go out into the mission field. Our field awaited us the rest of the day; at breakfast and the rest of the meal times, during the English and Bible lessons, afternoon games, hikes or other activities, the evening Bible meetings and bonfires. Instead of viewing these times as a chore or something to check off my list, my mind and heart were set to trying to get to know the Czechs so that I could speak to them in a meaningful way about the Gospel of our Lord Jesus Christ. Even during the set up and tear down of camp, my mind was grounded in the fact that my attitude and hands were working for the Lord and that He, along with the Czech people would see our efforts, hoping that we would bring Him glory. Along the way, I gained some cultural exposure too. 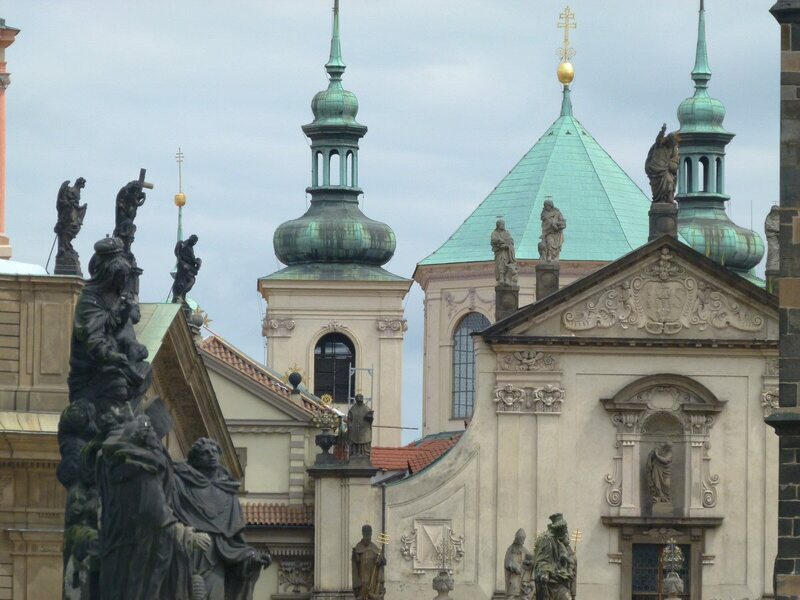 If I had been in the Czech Republic as a tourist, I doubt I would have been able to learn and see all that I did. On top of all that, the experiences and the days we had were always a blessing, a lot of work and at times, very, very enjoyable. The week of camp as I mentioned earlier was our time to get to know the Czech people and share the Gospel. For me, this required a different mindset and gave me a new sense of dependence on Him. The camp format was a new one to me too. The Lord was gracious to help me in my understanding and give me a lot of practice. Sometimes, all I could do was to think to ask if a person went to church or what one thought of the evening’s Bible message. Other times, I was able to start discussing if someone thought the world was just chaos or if God was in control over all things, or discuss how often I pray, the content of prayer, God’s character, the role of believers, the importance of corporate worship and regular time to meditate on God’s word. God showed me that this mindset is one that I need to have everyday, whether in the Czech Republic, at home or anywhere the Lord calls me. He also allowed me to get to know a few people well and in doing so, gave me a way to stay in communication with them and put them all on my heart, to pray for their salvation. In May of this year, Pastor Moersch preached on Psalm 67, telling of what the Lord has done throughout history to Israel and to the Gentiles and how the Lord chose to spread His blessing through His people and then into the world. He chose you and I to share His word, the good news and that we should be bold witnesses. I am so grateful that the Farniks, the other team members, my pastor, the session and presbytery have shown me the way to be a good witness. My prayer is that my heart will be filled as it was after our team sang the Doxology together. The Lord has given me an important experience through the mission trip that I hope will continually give me boldness to share His word and glorify Him.